This Marie Curie mug is part of a biographical series profiling unique scientists & inventors. This mug includes an image of Marie Curie and a short biography. This Charles Darwin mug is part of a biographical series profiling unique scientists & inventors. This mug includes an image of Charles Darwin and a short biography. This Albert Einstein mug is part of a biographical series profiling unique scientists & inventors. This mug includes an image of Albert Einstein and a short biography. The Mary Jackson mug is part of a biographical series profiling unique individuals who shaped the Science & Physics history of the United States. An image of Mary Jackson and a short biography are features of this history mug. The Katherine Johnson mug is part of a biographical series profiling unique individuals who shaped the Science & Physics history of the United States. An image of Katherine Johnson and a short biography are features of this history mug. The Guglielmo Marconi mug is part of a biographical series profiling unique individuals. 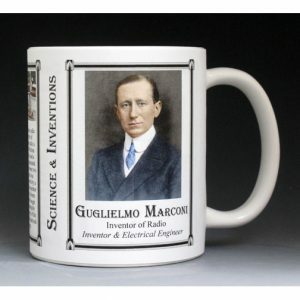 An image of Guglielmo Marconi and a short biography are features of this history mug. This Isaac Newton mug is part of a biographical series profiling unique scientists & inventors. This mug includes an image of Isaac Newton and a short biography. The Silk Moths mug is part of a biographical series profiling unique scientific categories and includes an image of silk moths and a short description. 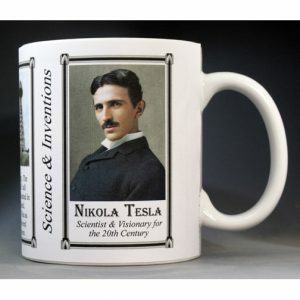 The Nikola Tesla mug is part of a biographical series profiling unique individuals and includes an image of Nikola Tesla and a short biography. The Dorothy Vaughan mug is part of a biographical series profiling unique individuals who shaped the Science & Physics history of the United States. An image of Dorothy Vaughan and a short biography are features of this history mug. This Eli Whitney mug is part of our collection of Civil War biographical mugs. An image of Eli Whitney and a short biography are features of this history mug.